It's not possible to change the camera zoom speed! If the addon doesn't work, check your addon list (ESC - Addons) if there are some dependencies needed. If yes, install them! Sometimes there is an issue in the Lib Dependencies, make sure you have LibScootworksFunctions installed too! 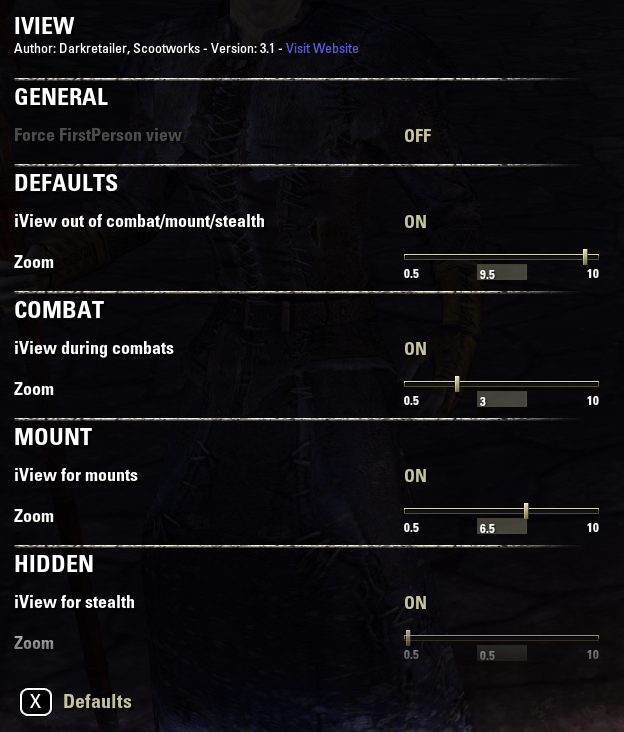 You can set a specific camera distance for default, in combat, in stealth or while mounted. The values are account-wide! No need to set it up for each character! Can confirm. This popped up last night after updating LibScootworks. 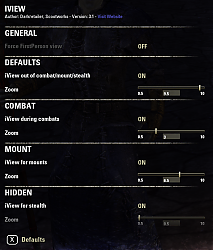 It would be great to see an update to this addon again. It's one that I sorely miss and is hindering my ability to play ESO again. Thank you for making this addon. When did this addon get discontinued? By far, one of my favorite addons, I love iView, super bummed if this isn't being actively maintained anymore!